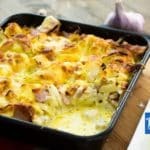 Keto Cauliflower Bake Recipe - "Cheesy Bacon" - Low Carb, EASY & Delicious! A Deliciously "Cheesy, Bacon" loaded Keto Cauliflower Bake that's so easy and affordable to make it will become a regular at the dinner table. Not only for Low-carb people but the Best way to cook cauliflower for sure.